Context: Incomplete posts on wikipedia were misrepresenting artists work and careers. I wrote and replaced these unhelpful posts with quality comprehensive articles, which also resulted in improved web search results for these artists. 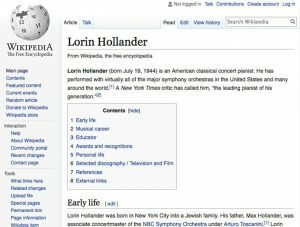 This enhanced the overall notability of two classical musicians careers on the most visited reference for online information – wikipedia. 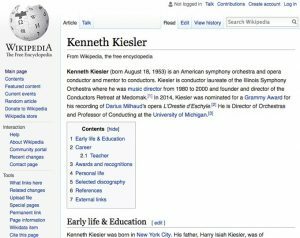 Who & When: The article for Kenneth Kiesler was written and posted in 2015, and the article for Lorin Hollander was written in 2013. What & How: Wikipedia articles written and created based on discussing the priorities and goals of each client. To assure compliance with Wikipedia standards, content was written, revised and finalized based on thorough research and with use of comprehensive digital citations. My clients provided initial biography material. The final text was based on editing the provided materials, and utilizing content from extensive online research and compilation of quality references. Articles were formatted with HTML markup in the wiki environment. One project’s approval and completion resulted in a bonus for its quality and thoroughness. Result: Improved clients’ online presence and search results with highly reputable wikipedia entry.